In a post entitled “ http://purefirepizza.com/?wordfence_lh=1 orlistat full strength So, You Want to Buy a House?” I stated that the first step in buying a house is to determine how you intend to pay for the house. The two ways to pay for a house are to 1) pay cash, or 2) finance. If paying cash isn’t an option for you, the next step is to get prequalified to determine how much you can qualify to borrow and the total monthly mortgage payment that accompanies that amount. Once you’ve been prequalified and you know approximately how much cash you’ll need to complete your purchase, you can begin your home search with an idea of your maximum purchase price and the corresponding monthly mortgage payment. A word of warning! While getting prequalified is an important step in the process, it may not be as reliable as you think. Getting prequalified is typically accomplished via an informal phone conversation with a loan officer representing a bank or mortgage company. At this stage the amount you can qualify to borrow is a matter of opinion and is based on your answers to questions about your income, assets, liabilities, and credit history and credit score. 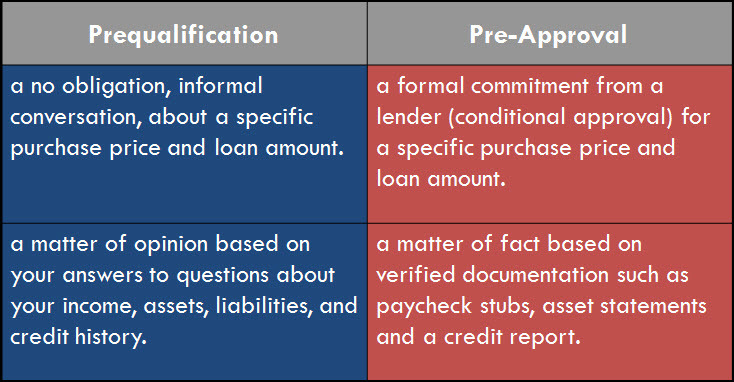 Without the actual income and asset documentation and a residential mortgage credit report, including credit scores from each of the three credit repositories, prequalification is only as reliable as the answers you provide to the loan officer, and that assumes that any loan officer you might speak with has the experience necessary to determine your qualification, and that is not always true. With that in mind, it is highly advisable to get formally approved for the amount you intend to borrow. Pre-Approval is a formal commitment from a lender (conditional approval) for a specific purchase price and loan amount. It is a matter of fact based on verified and validated documentation such as actual paychecks, W-2s, income tax returns, asset statements, and a credit report that includes credit scores. It is referred to as pre-approval because you are more than likely applying for loan approval before you have identified a specific house you would like to purchase. There is a process called an automated approval, more commonly known as a DU approval, which uses artificial intelligence to issue an approval based on information entered into the automated underwriting program. There are two types of automated approvals. The first, and most common, is an automated approval issued over the phone based on your answers to questions about your income, assets, liabilities, and credit history, including credit scores. Don’t be fooled by commercials that tell you they can give you loan approval in minutes, or even seconds, over the phone. This type of automated approval is only as accurate and reliable as the data that was provided to generate the approval. If any piece of information that was utilized to issue the automated approval turns out to be different (i.e., income, assets, down payment) then the automated approval is invalid. Automated approval, known as a DU approval, that is based on actual documentation you provide is a legitimate approval. If you’re interested in learning more about what it takes to purchase a home of your own, you’ll want to read other posts in the series, such as What is The Greatest Obstacle to Borrowing Money to Purchase a Home?, What Are Lenders Looking For? Character!, What Are Lenders Looking For? Capacity!, What Are Lenders Looking For? Collateral!, What Are Lenders Looking For? Credit!, The Two Approvals, and more.